This was a super easy, super tasty workday dinner. I was re-reading one of my favorite foodie books, Smart Chefs Stay Slim. If you haven’t read it, I highly recommend it! It’s an fascinating book about how chefs eat and stay healthy, and their attitudes toward food when they aren’t cooking in a restaurant. In it, Chef Rick Moonen mentions a recipe he makes for “everything-crusted” tuna. Sesame seeds, poppy seeds, onion, garlic, salt – all the things you would find on an everything bagel! Now, I am a huge fan of everything bagels, so I had been intrigued by this brief description since the first time I read the book. I’ve never cooked tuna at home, so I went for salmon. 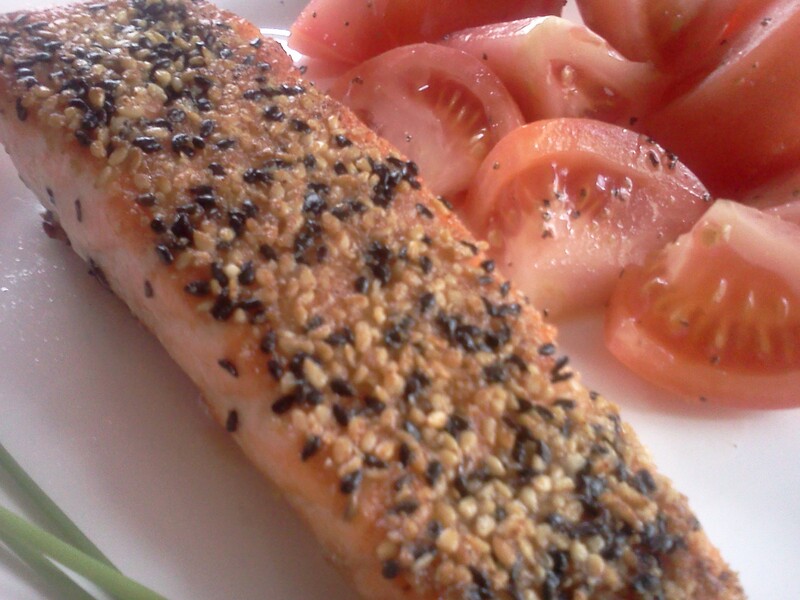 I didn’t have poppy seeds, but I did have black sesame seeds, which worked perfectly. They gave it the same “everything bagel” look and tasted amazing! I chopped up some tomatoes and tossed them with a bit of olive oil, salt and pepper for a side. (The chives just made it into the picture for some additional color on the plate.) It was beautiful, light, tasty, quick and easy – perfect! Anybody read Smart Chefs Stay Slim? What’s your favorite book about cooking or eating? 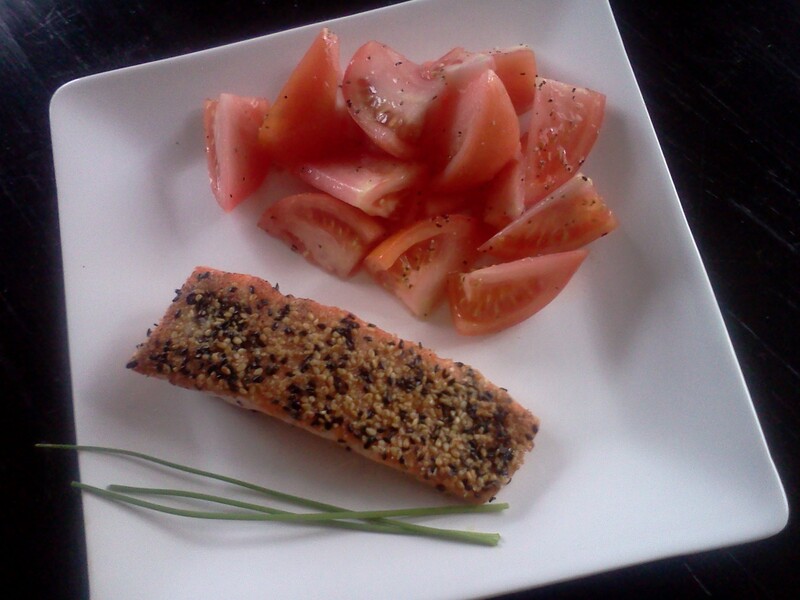 This entry was posted in Dinner, General, Recipe and tagged dinner, salmon, smart chefs stay slim, workday dinners on March 27, 2013 by Melissa. Your salmon looks delicious I will make this one day! Thanks! I love dishes that look more complicated than they really are – this was super simple and tasty. Thanks, Meghan! The “everything” topping would probably be good on grilled chicken or pork as well. Nice !! I will have to try this! I attended a cool lecture at the Natural Grower’s store here in Missoula this evening… all about nutrition and cooking healthily. She didn’t mention that book, but had a slew of others that I hope to check out and can review for you down the line! 🙂 ALSO, and more importantly– I learned that Missoula has a CSA box program ! I am thinking about signing up for my own box of organic goodies this summer. That’s awesome! Sounds like a really interesting lecture. I wonder what kind of goodies you’d get in that CSA – very cool! Let me know if I should check out any of the books! What a healthy dinner! Sounds great. You know how much I love salmon. Miss eating it with you at The Erie Station Grille. Their salmon was so good too.I love “The New Basics Cookbook.” Kim got it for me one Christmas. It has a little bit of everything in it. Roasting times, sauces , many great recipes. Touches on all the basic needs in the kitchen. I know – we have to find a way to recreate their cajun salmon since they closed. You’ve mentioned that cook book before as a great reference, but I don’t think I’ve ever read it. I may have to borrow your copy! Yum! I just told Kim that I am hungry for a delicious salmon dinner with a side of sweet potato and a big wonderful salad! I am going to make this next week because Kim is almost at the point where he can eat “whole foods” again! Yeah! I can’t believe your Mom mentioned that New Basics cookbook as a great resource because that was the one I was going to say too! Kim found one used for Elyse and we will look for one for you too, Sweetheart! Also, I was listening to Lynn Rosetta Kasper on “The Splendid Table” on NPR on Saturday and she recommended a book called “The Pie Bible.” I think you should get that one too now that you are baking some! Thanks, Aunt Care! If you make it, let me know how it turns out. I’ve never heard of “The Pie Bible”, but I’ll have to look it up. Thank you! Hey Lis I have to chime in on the New Basics. It is my go to book. I have never made a recipe from that one that was not fantastic. I hate to say that because now everyone will know my secrets. My new favorite is however the Jeni’s Ice Cream Book. That may be giving a hint of what is coming this summer for the deck! I scored a copy of the New Basics for you should be here soon! I love everything bagels and once found a jar of Everything seasoning at a Marshall’s or TJ Maxx. I gave it away when my spouse returned because he can’t eat poppy seeds, but I’ve been looking without success for a new jar for this summer. Coating a piece of salmon with it will be second on the list, after a pizza. I’ll have to be on the lookout for that Everything seasoning – if I find it anywhere, I’ll definitely let you know! I bet it would be great on pizza, but then again, what isn’t? Thanks, Kirsten!